I love Google Maps; I can sit for hours looking for new places suitable for taking photos and flying drone — or just going back to places I miss. Most recently, I was looking if my wife’s hometown in Lam Thap, Krabi was added to Google’s Street View, and it was! You can visit my in-laws’ house, and when zooming in you can see a family member sitting by the door. Excited about the fact that Lam Thap was added to Street View, I took a trip through my wife’s hometown in the countryside and took some screenshots along the way. It would be cool to make a hyperlapse movie, but it’s pretty time consuming and there is not much excitement going on here. Maybe I do one in a more fun environment next time. At the bottom of this post, I show how to find beautiful spots using Google Maps. I was pretty surprised to see my in-laws’ house. I mean, a Google employee was actually standing there with a huge 360-degree camera on the dirt road in the middle of nowhere. I’m impressed. Google added this location to Street View in March 2016, a month before our wedding party which is why the path up to the house has freshly laid gravel (mostly dirt otherwise). Good timing. An oil palm plantation surrounds the house. Banana trees along the roadside. A nice house along the road traditionally built on stilts with multiple gabled roofs. If we sometime in the future decide to build a house in Lam Thap, I would want it to look like this. I can see myself sitting there on the veranda drinking my Thai beer in the 30 degrees evening heat, smacking mosquitos on my legs. A pink house next to an oil palm plantation. The majority of people in this village earn their living from oil palms, from rubber tapping, or from both. The entrance to the school where my wife went as a child. Some party going on here. People are getting married all the time during this season. A scooter vendor on his way to the town to sell some fruits. A blue and yellow water tower. Arriving at the three-way intersection of the town of Lam Thap. The market where my mother-in-law buys fresh vegetables, meat and fish several days per week. A man wiping off sweat from his forehead while the chicken is getting ready on the charcoal grill. Just by looking at the picture, I can feel the tropical heat and smell the grilled chicken. 7-Eleven is a big thing in Thailand and my favorite store. You can find pretty much everything you need, and people also come here to pay their electricity bill, withdraw cash and to check their weight on the 1 baht scale. A Honda store selling scooters. The end of Lam Thap and Krabi Province. Those mountains act as a gateway to the province of Nakhon Si Thammarat. I could continue, but I stop here. In this example, I change to satellite view and look for mountains in remote areas in Krabi. 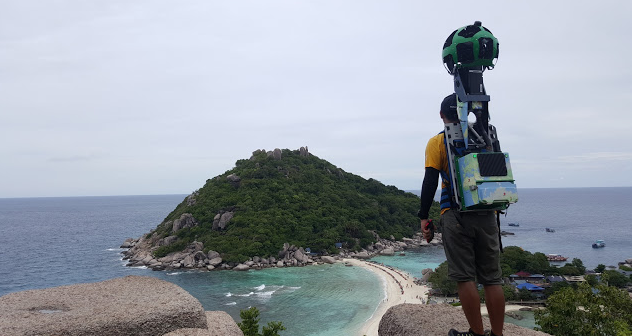 When I find a spot I think looks cool, I drag the yellow Street View guy to the place I want to check out. After walking around the area in Street View, I found this spot. I would love to fly my drone up those mountains. In this example, I change to map view to find lakes in Krabi. While it may not be a spectacular spot in the midday sun, this place is incredible in the early morning with the sun behind those mountains in the east. Check out the first 20 seconds of this drone video I made last year. It’s pretty amazing that you can travel the world without leaving your house. But sure, nothing beats real-world traveling experiences.